Marine mammal mitigation requirements for seismic operations vary depending on location and size of the survey. OSC has over a decade of experience working within the seismic industry, a firm understanding of all guidelines, and can assist at every step of the way, from advice during the project planning stage to the provision of Marine Mammal Observers (MMO) and Passive Acoustic Monitoring (PAM) Operators. OSC’s dedicated Marine Mammal Observers (MMOs) are deployed on a range of offshore industry projects; crucially, they all have prior seismic experience, considered vital in the understanding of marine operations and offshore life in general. Presence of seismic streamers and airgun arrays means deploying hydrophone arrays from seismic vessels can be more complex than for other survey types. OSC PAM Operators have previous experience, and are able to work successfully with seismic crew to ensure hydrophone cables are deployed in a way that minimises inconvenience to crew, and reduces the chance of damage but maximises the chance of a detection. This ensures smooth running of operations, and minimal downtime. OSC’s highly experienced MMOs and PAM Operators provide immediate, on-the-spot advice on how to reduce operational downtime and minimise project impact on marine wildlife (whales, dolphins porpoises seals and turtles) without breaching environmental protocol and regulations. See our services for more information on OSC MMO and PAM Operator qualifications, guidelines, and medicals. OSC can provide MMOs and PAM Operators from any nationality, to suit local project requirements. OSC MMOs and PAM Operators are ready from mobilisation 24-7, anywhere in the world. OSC’s UK head offices are close to three international airports, and only 45 minutes from the international Port of Leith (Edinburgh), the mobilisation port for many seismic vessels in the North Sea and wider Atlantic. 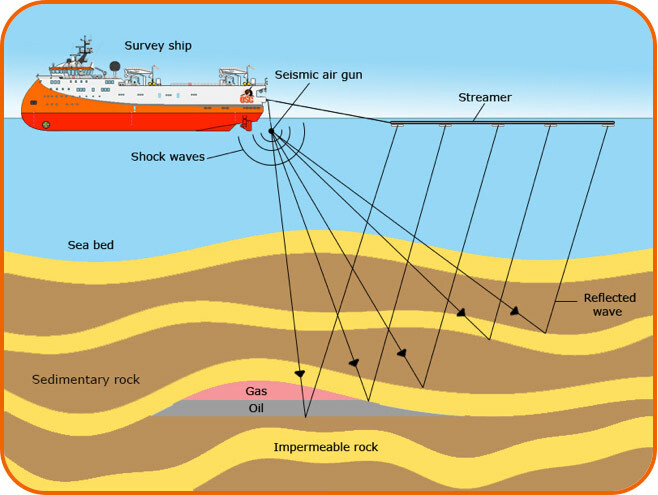 Contact us to discuss your seismic survey requirements.